Swine flu! World Health Organization at alert level 4! Markets rocked by sell-offs! Howie Mandel was right! Never shake hands! Bathe in Purell! See if you can borrow a face mask from Michael Jackson! Or hold your breath whenever you are near a ham sandwich! Armies of pigs in uniform marching on Washington! Orwell was right: the animals have turned on us, become more dangerous than us! Four legs bad, two legs good! Head for the hills! Once again, the media is reacting to a potential threat with its usual calm, responsibly recognizing that sensational coverage of diseases can have far worse consequences than the diseases themselves. Or not. “Moderation in all things” isn’t exactly the motto of cable news, is it? To be fair, though, figuring out the right reaction isn’t easy. Sure, swine flu 1.0 was a bust, avian flu was a bust, and SARS was a bust, so maybe SF 2.0 will be a bust too. Then again, this might be The One, and we might never know. After all, if all the hype manages to keep the current strain from mutating into the Andromeda Strain and destroying humanity, we’ll never know, will we? It’ll just look like another bust. So will we ever know if SF 2.0 was The Big One? If it kills a billion people, yes. If it doesn’t, no. We’ll just have to keep wondering. Which, to my surprise (and to change the subject completely), turns out to be a big chunk of what Nassim Nicholas Taleb writes about in The Black Swan. After I was (properly) smacked down over my airy dismissal of Taleb a few days ago, I finally decided that maybe I ought to actually read his book instead of relying on the odd blog post about it, and I have to say that it’s not at all what I expected. So far, anyway. It’s a real mishmash of odd potted historical anecdotes that go nowhere, interesting insights about human nature, opinions about historical contingency that are strangely unmoored from even an acknowledgment that lots of other people have thought about this subject before, and conventional observations about things like confirmation bias and the limits of induction. However, Taleb swears that he’s a doer, not an idle idea spinner, and by the time I’m finished I’ll get some genuinely concrete advice about how to deal with uncertainty and the limits of knowledge in real life. We’ll see. 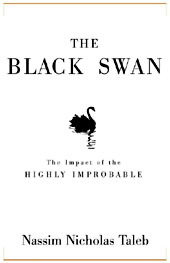 I’m a little skeptical based on the first few chapters, but I suppose Taleb himself would warn me that even a long string of mediocre chapters doesn’t mean there won’t be a phenomenal one that will rock my world when I least expect it. If I finish it this weekend, I’ll report back.